Wielding a sharp knife with slippery hands around open flames and nearby children doesn't sound like the best idea—but that's exactly what millions of Halloween celebrations entail. 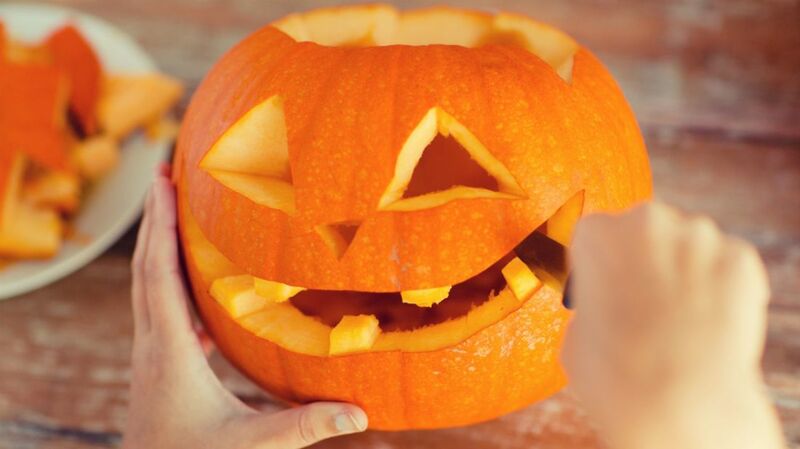 While pumpkin carving is a fun tradition, it can also bring the risk of serious hand injuries. According to the American Society for Surgery of the Hand (ASSH), some wounds sustained from pumpkin misadventure can result in surgery and months of rehabilitation. Fortunately, there are easy ways to minimize trauma. Both ASSH and CTV News have compiled safety tips for pumpkin carvers intended to reduce the chances of a trip to the emergency room. First, it's recommended that carvers tackle their design with knives made specifically for carving. Kitchen knives are sharp and provide a poor grip when trying to puncture tough pumpkin skin: Pumpkin carving knives have slip-resistant handles and aren't quite as sharp, while kitchen knives can get wedged in, requiring force to pull them out. Carvers should also keep the pumpkin intact while carving, cleaning out the insides later. Why? Once a pumpkin has been gutted, you’re likely to stick your free hand inside to brace it, opening yourself up to an inadvertent stab from your knife hand. When you do open it up, it's better to cut from the bottom: That way, the pumpkin can be lowered over a light source rather than risk a burn dropping one in from the top. Most importantly, parents would be wise to never let their kids assist in carving without supervision, and should always work in a brightly-lit area. Adults should handle the knife, while children can draw patterns and scoop out innards. According to Consumer Reports, kids ages 10 to 14 tend to suffer the most Halloween-related accidents, so keeping carving duties to ages 14 and above is a safe bet. If all else fails and your carving has gone awry, have a first aid kit handy and apply pressure to any wound to staunch bleeding. With some common sense, however, it's unlikely your Halloween celebration will turn into a blood sacrifice.